It was the year we succeeded with the Delivery Plan, then the action really had to happen! The invitation to form an NDC. Partnership had resulted in a small group of people forming a residents association. Public meetings were then called to inform the wider community and increase involvement. People attended those first public meetings and two groups of people came forward to form a tidy-up scheme and an after-school playgroup. 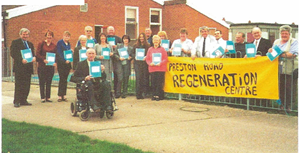 “As chairman of the Preston Road Residents Association, this Delivery Plan is with renewed hope the best way forward for all residents on the estate hope and pray the estate can look forward to a much brighter and wealthier future.” Ray Birch, Chairman, 21 February 2000. 28 signatures of the Shadow Partnership Board on the Delivery Plan.